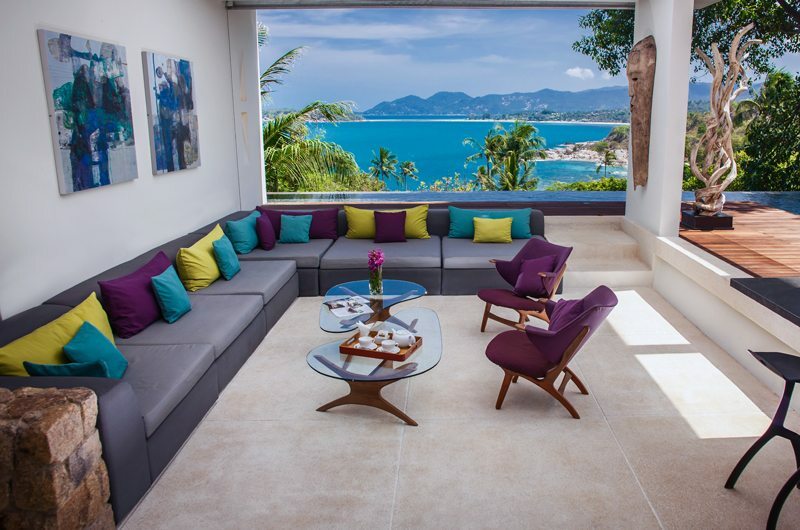 This Exclusive 5 Bedroom Luxury Villa for Sale in Koh Samui is perched on the prestigious Choeng Mon hillside, with panoramic unhindered ocean-views. Sitting in a secure private gated community within a private tropical enclave using unique natural rock formations as the foundation of its design. The striking architecture comes from the award-winning and talented Garry Fell, creating an ambience of tranquility, privacy and relaxation. This Luxury Koh Samui Property is part of a series of unique villas in a highly exclusive complex, that has most of the facilities and concierge services of a 5* hotel. The villa itself is constructed with an open-air design to maximize light and space, allowing fresh breeze to blow through the villa and creating an open and relaxed living space. Constructed with an ultra-modern, minimalist approach, the structure is a beautiful example of the most opulent architecture. The focal point of the property is a stunning infinity-edge swimming pool surrounded by natural rocks, limestone feature walls and an immaculately manicured tropical garden. The huge pool forms an L-shape wrapping around the sun-deck and open-air living spaces, with spectacular sea-views to Koh Phangan and beyond. The property boasts five beautiful bedroom suites, complete with giant comfortable beds, high-quality custom built furniture and elegant en-suite bathrooms with terrazzo oversized soaking tubs, and stunning sea views, and lush garden views. Each room has a unique design and decoration retaining freshness and uniqueness throughout. This exceptionally designed and constructed villa is now currently available for resale. 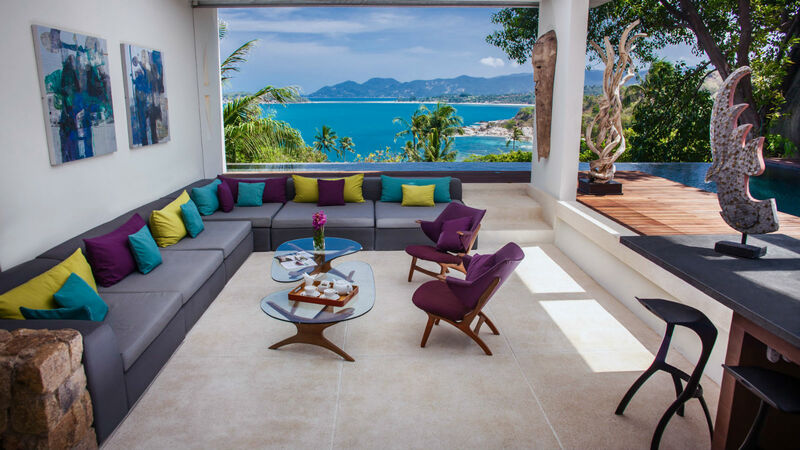 With a full successful rental history and impeccable maintenance, this villa represents the quintessential of luxury tropical living on Koh Samui. The pool is sumptuously decorated and surrounded by well-placed shrubs, flowers, and mature trees to create a peaceful and private place. The pool and terrace, is an ideal place for parties, BBQ’s or relaxing in the shade on a hot summers day. 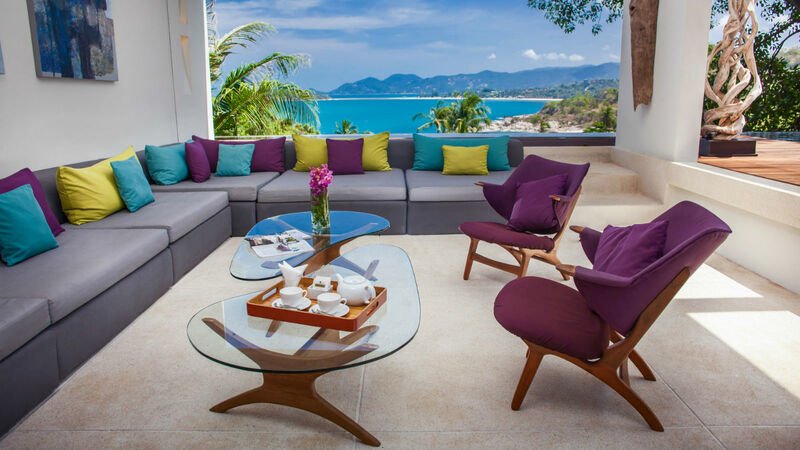 Situated immediately adjacent to the pool area is an elegant open-air living room featuring comfortable and ergonomically designed soft chairs and a private bar area with spectacular ocean-views across the Choeng Mon bay. The dining area features a large solid hardwood table with comfortable seating for eight people. A fully fitted European kitchen comes equipped with branded appliances and accessories and a bar that run between the kitchen & dining area. The bedrooms include huge comfortable beds, relaxing lounge areas, en-suite bathrooms with stunning stone and tile features, and private balconies with sea-view & garden views.